The bracket on very early cars has round bolt holes, the later cars bracket has oval holes. The round holes must be elongated outward to fit the Tilton pattern. 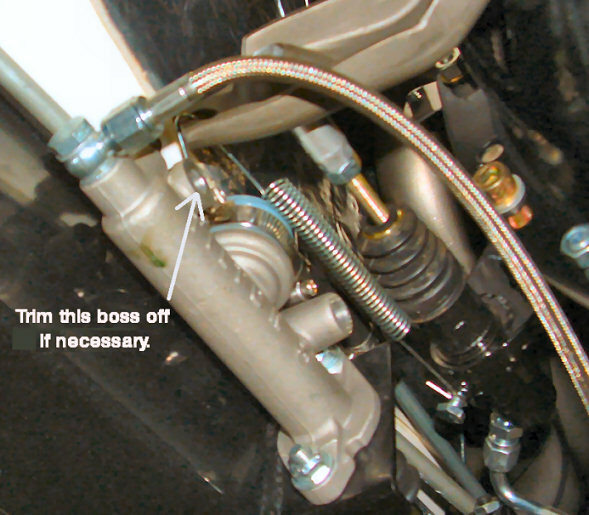 Trim the feed tube back (or replace it) and make a sealing flare to mate with the master cylinder feed hose. Note! On early cars with a vertical mounting bracket face (later cars mount the master cylinder tilted up at the back), make sure that the retaining circlip has its gap at the bottom. If you don't do this, possible interference might cause the link to bend or break.